Australia's rugby union governing body has chosen Raelene Castle as its new chief executive, the first time a woman has been given the job. 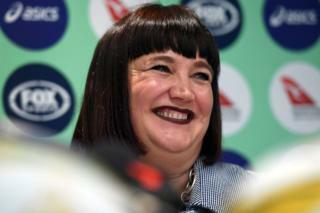 Rugby Australia said Ms Castle was "extremely impressive" with an "outstanding track record". The appointment of the experienced sports administrator makes her the first female leader across all major national bodies in world rugby. She reportedly beat more than 200 candidates for the job. At a news conference Ms Castle told reporters that "it's interesting the media have an enormous fascination" with the fact that she is the sport's first female boss.